Terry has always liked to draw and probably should have gone to art school — but with her agriculture background, the pull to ranch was stronger. She found she loved to raise the sheep, but did not have the patience for weaving and felting spinning. Terry started drawing in the evenings and into early morning, trying to get a picture to her satisfaction. Lambing time was ideal for drawing because Terry was already up early in the morning! Terry’s goal was to have another income for her family and began looking into ideas. She checked out tourist shops, western wear stores and gas stations to see what items were on the market and decided to gear her products toward tourists. Terry started out making t-shirts comprised of Wyoming, Colorado, and Montana “letters” made into western pictures. Still wanting to push forward, Terry trusted in her faith to guide her. She wanted an American made, plus Wyoming made, product; something usable that would represent her art well. Terry’s dad said once, “A person only has so many walls to hang pictures.” So, she thought…how about coasters? She commissioned someone to laser her art on the coasters; these were well liked, but a bit pricey. Then she thought cutting boards. 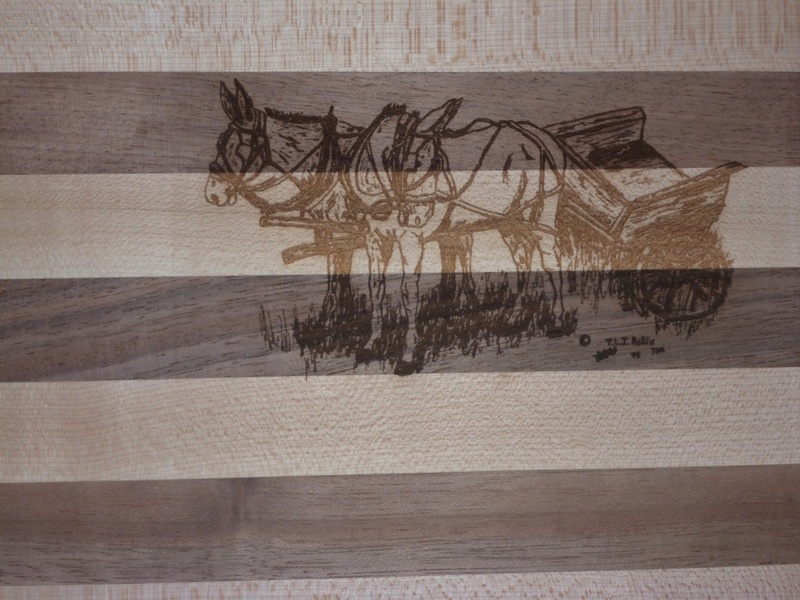 She tried purchasing white plastic cutting boards, adding her artwork via laser. Terry was not impressed with the result. Terry liked working with wood and while in a wood workers’ supply store asked if anyone knew of someone that had experience. This is when she was introduced to her cutting board maker, one of her popular items. 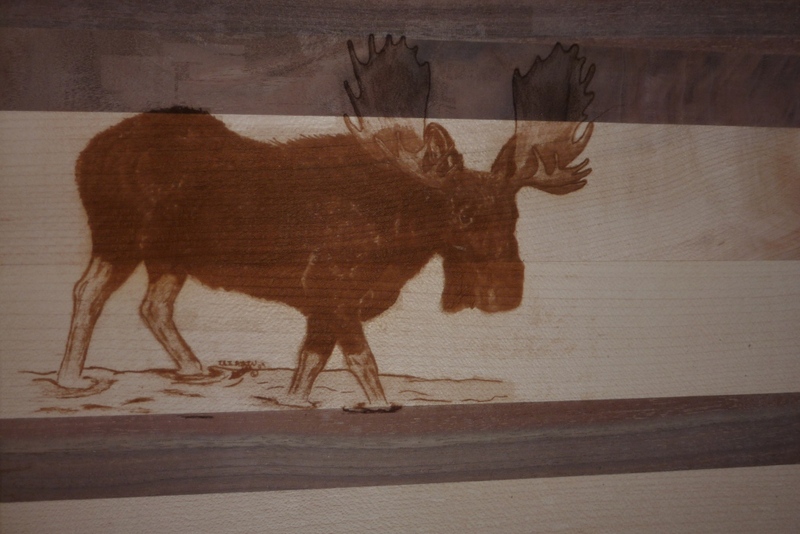 Terry is learning a lot about wood now and hopes to develop other usable products for interior decorating. Terry loves animals and uses her art to connect with others, sharing how she was raised and the Wyoming ranching life. She uses her gift to help others see what we are so honored to have here in Wyoming and in the U.S.A. — including life and freedom to be able to do anything we set our minds to. Terry feels honored to have the opportunity to share her art on usable handmade products that will hopefully last a lifetime. Terry will begin taking custom orders starting this winter. If it is a commissioned picture it may take longer, but she is learning how to take photos and apply them to objects. She has done wedding gifts using her art and personalizing the boards. She has also created a cutting board for children’s names and a prayer; one side to use and one to display. 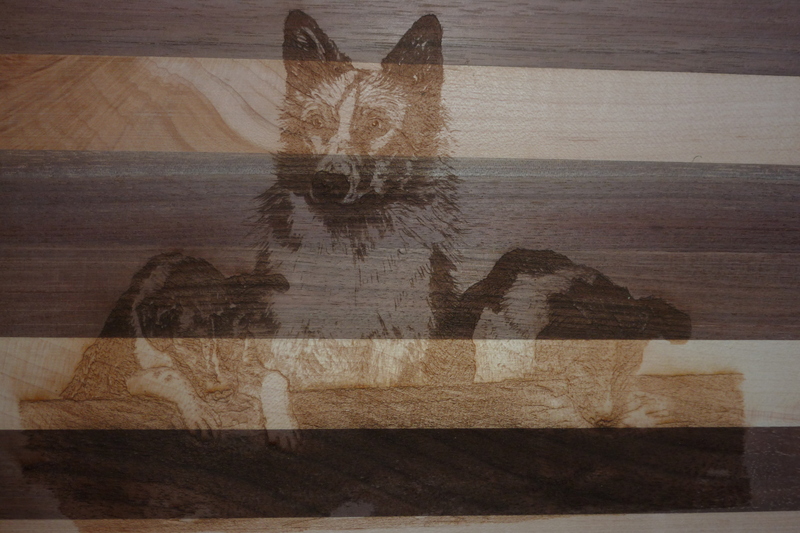 She has used her laser to embellish a dresser, making is personal and usable. Currently, Horseshoes and Feathers products are being sold from Terry’s home, as well at at the Wyoming Mercantile at the Wyoming State Fair. This year her artful products will be sold during Cheyenne Frontier Days in the Old Frontier Town at the General Mercantile. Terry is now exploring Etsy and Zibbet as a means to sell her products in the next year. 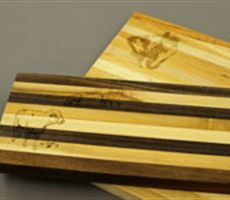 As of May, 2013, Horseshoes and Feathers’ prices on cutting boards start at $25.00 for an 8”x12-1/2” board, to $50 for a 16”x11 1-1/2” board. The art on these boards is a simple display of the Wyoming way of life; the more detail higher the price. Terry can be contacted at horseshoesandfeathers@gmail.com. Please provide a phone number on subject line or it may be considered a spam.Contact Terry directly for pricing on custom orders. Terry feels the laser machine is an incredible art machine and the possibilities are endless! Horseshoes and Feathers, along with her art, is trademarked.